A few days ago I posted a blog that discussed the concept of Universal Design (transportation facilities designed to accommodate all possible users, including those with disabilities and other special needs) and the value it provides to individuals and communities. One way to approach this issue is to define the design vehicle for pedestrian facilities. 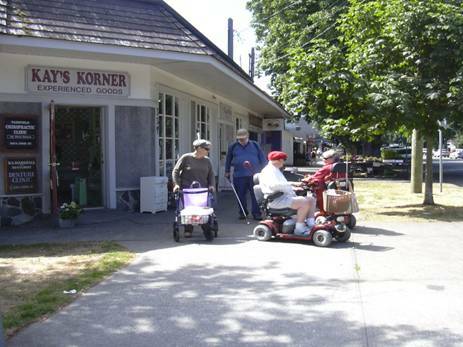 The "design vehicles" of a sidewalk or path should include people using walkers, wheelchairs and other assistance devices. A design vehicle is the largest vehicle intended for a particular roadway, which defines factors such as lane dimension, turning radii, clearances, and pavement strength. For most roads this is a fire truck (maximum length: 28 ft; maximum height: 13.5 feet; maximum width: 8 feet) or coach bus (maximum length: 40.3 feet; maximum height: 11 feet; maximum width: 8 feet; maximum weight: 36,200 pounds; turning radius: 40.5 feet). In addition to the vehicles' dimensions it is important to provide adequate shy distance, the clearance needed between moving objects (pedestrians and vehicles) and other moving or stationary objects (pedestrians, vehicles, street furniture, buildings, landscaping, etc.). As travel speeds increase, shy distance requirements also increase. For example, slow pedestrians may be able to pass comfortably with just 0.5 feet of sideways clearance, but a jogger requires at least 1.0 feet, a cyclist 2-4 feet, and a motor vehicle 4-6 feet under urban conditions, and even more at highway speeds. Anything narrower forces travelers to reduce their speeds, causing travel delay. Sidewalks and paths require adequate surface width, and horizontal and vertical clearance. · Pedestrian using a walker (requires 3.0 feet surface, 4.0 feet clearance, and smooth surface and ramps). · Tourist with wheeled luggage (requires 3.0 feet surface, 4.0 feet clearance, and smooth surface). · Jogger (requires 3.0 feet surface, 5.0 feet clearance). · Parent walking with a child in hand (requires 4.0 feet surface, 6.0 feet clearance). · Romantic couple walking arm-in-arm (requires 4.0 feet surface, 5.0 feet clearance). · Buseness colleagues with briefcases walking side-by-side (requires 5.0 feet surface, 6.0 feet clearance, and smooth surface). · Wheelchair user with an assitance dog or pet on leash (requires 5.0 feet surface, 7.0 clearance, and smooth surface and ramps). · Two parents walking side-by-side pushing strollers (requires 6.0 feet surface, 7.0 feet clearance and ramps). · Wheelchair user out on a date with somebody using a walker (requires 6.0 feet surface, 8.0 clearance, smooth surface and ramps). These dimensions reflect pedestrian traffic going in one direction. As soon as people or groups must pass each other, either going in opposite directions or one going faster than another, these minimum dimensions must essentially double. This is a minor problem on sidewalks and paths with little traffic, where interactions between pedestrians are infrequent, but is a major cause of friction and delay where pedestrian traffic is heavy. It is also important to recognize the difference between "nominal" (in name) and "functional" (in practice) sidewalk dimensions. Sidewalks tend to collect encroachments like wild dogs collect fleas: utility posts, street furniture, garbage, sidewalk cafes, panhandlers, parked vehicles, etc. As a result, the actual clearance is often much smaller than what is intended or officially claimed. For example, the photo below illustrates the sidewalk across the street from my home. The nominal dimension is 5 feet, adequate for most single pedestrians or even a friendly couple. However, where it passes a utility pole or parking regulation sign the functional dimension, including both surface and horizontal clearance, is just 3.0 feet, which forces even somebody walking alone to slow down, and forces pedestrians using wheelchairs or carrying wheeled luggage, or couples walking arm-in-arm, to nearly stop in order to carefully maneuver around the obstacle – which slows pedestrians and spoils the romantic mood. Although this sidewalk has an adequate nominal dimension of 5.0 feet, its functional dimension is only 3.0 feet, insufficient for many users. 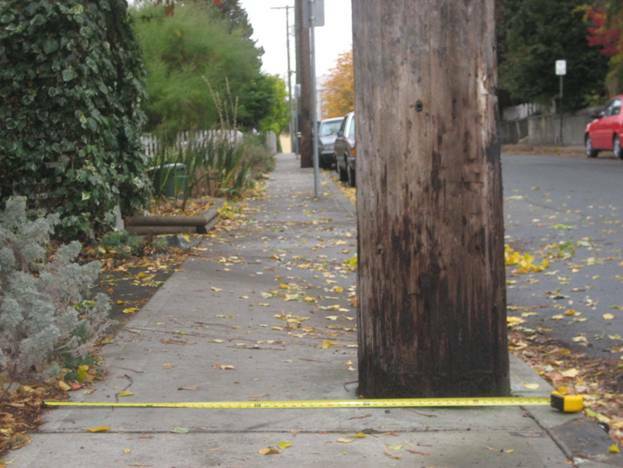 So, what is an adequate sidewalk dimension? On residential streets with modest pedestrian traffic, 5.0 to 6.0 feet of surface and clearance is generally adequate, but much wider sidewalks and paths are needed where pedestrian traffic volumes are greater, or adjacent to high-speed motor vehicle traffic where additional clearance is needed, preferably with a greenspace boulevard to provide a buffer. Additional width is needed where street furniture or other encroachments exist or might develop sometime in the future, such as in growing commercial districts. These must be functional dimensions: actual clear space between pedestrians and other objects. In addition to these basic geometic design requirements, the design vehicle also defines factors such as street crossings (acceptable curb-to-curb distances and pedestrian signal timing), ramp and curbcut inclines and widths, surface quality, and maintenance practices. For example, many arterials are too wide for slower pedestrians (such as many elderly people) and so require a traffic island in the center (a pedestrian refuge) so pedestrians need only cross half way at a time. Many older curbcuts are too narrow and steep, and cracks or potholes in sidewalks, and gravel rather than paved paths, can present barriers to people using wheelchairs or wheeled luggage. The concept of a pedestrian design vehicle is useful in both a general sense, by helping people think about the wide range of pedestrians that should be accommodated, and in a specific sense, because this is how traffic engineers design facilities and prioritize improvements, and so can help planners and engineers upgrade pedestrian conditions. For example, once the sidewalk design vehicle is defined you can point out which facilities are failing in your community, which creates an imparative for correction. This is how roadway projects are often justified; we can apply the same planning and budgeting process to sidewalks and paths. This is often presented as a special design requirement to accommodate people with disabilities, but it really reflects the basic requirments for all sidewalk users, so anybody can travel efficiently and comfortably, even when they are using wheeled luggage, handcarts, wheelchairs, or traveling with family, friends or romantic partners. Access Board (2006), Public Rights of Way, U.S. Access Board: A Federal Agency Committed To Accessible Design (www.access-board.gov/prowac). Access Exchange International (www.globalride-sf.org) is a non-profit organization that promotes cost-effective access to public transportation for disabled persons in developing countries. Accessibility Planning Website (www.dft.gov.uk/pgr/regional/ltp/accessibility), by the UK Department for Transport, provides extensive information on planning strategies to improve social inclusion. Alta Planning + Design (2005), Caltrans Pedestrian and Bicycle Facilities Technical Reference Guide: A Technical Reference and Technology Transfer Synthesis for Caltrans Planners and Engineers, California Department of Transportation (www.dot.ca.gov/hq/traffops/survey/pedestrian/TR_MAY0405.pdf). Beneficial Designs, Inc. et al. (1999 and 2001), Designing Sidewalks and Trails for Access; Part 1, Review of Existing Guidelines and Practices, Publication No. FHWA-HEP-99-006; Designing Sidewalks and Trails for Access; Part 2, Best Practice Design Guide, Publication No. FHWA-EP-01-027, Federal Highway Administration, USDOT (www.fhwa.dot.gov/environment/bikeped). Complete Streets (www.completestreets.org) is a campaign to promote roadway designs that effectively accommodate multiple modes and support local planning objectives. CSE (2009), Footfalls: Obstacle Course To Livable Cities, Right To Clean Air Campaign, Centre For Science And Environment (www.cseindia.org); at www.cseindia.org/campaign/apc/pdf/Walkability.pdf. Reid Ewing, Otto Clemente, Susan Handy, Emily Winston and Ross C. Brownson (2005), Urban Design Qualities Related to Walkability: Measurement Instrument for Urban Design Qualities Related to Walkability, Robert Wood Johnson Foundation Active Living Research Program (http://activelivingresearch.org/index.php/357). FHWA (2001), Designing Sidewalks and Trails for Access; Part 2, Best Practice Design Guide, Federal Highway Administration, USDOT (www.fhwa.dot.gov/environment/bikeped), Publication No. FHWA-EP-01-027. FHWA (2008), A Resident's Guide for Creating Safe and Walkable Communities, Federal Highway Administration Office of Safety; FHWA-SA-07-016 (http://safety.fhwa.dot.gov); at http://safety.fhwa.dot.gov/ped_bike/ped/ped_walkguide. Todd Litman (2006), "Managing Diverse Modes and Activities on Nonmotorized Facilities: Guidance for Practitioners," ITE Journal, Vol. 76, No. 6 (www.ite.org), June 2006, pp. 20-27; based on Todd Litman and Robin Blair (2005), Managing Personal Mobility Devices (PMDs) On Nonmotorized Facilities, Victoria Transport Policy Institute (www.vtpi.org); available at www.vtpi.org/man_nmt_fac.pdf. Project for Public Spaces (www.pps.org) works to create and sustain public places that build communities. It provides a variety of resources for developing more livable communities. Tom Rickert (1998 and 2002), Mobility for All; Accessible Transportation Around the World and Making Access Happen: Promoting and Planning Transport For All, Access Exchange International (www.globalride-sf.org) and the Swedish Institute On Independent Living (www.independentliving.org). These excellent guides provide information on how to implement Universal Design in Developing as well as developed countries. Walkable Communities (www.walkable.org) helps create people-oriented environments. Walkable Places Project (www.walkableplaces.org) provides resources to help non-experts evaluate barriers and opportunities for walking.